Can trauma haunt the body the same way it haunts memories? 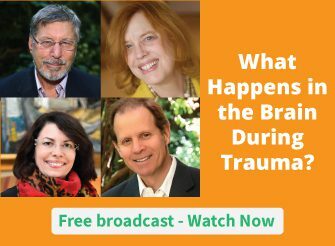 According to Stephen Porges, PhD, not only does the body remember a traumatic experience, but it can actually get stuck in the trauma response mode. So even when the threat is gone, the body still perceives danger and its defenses stay engaged. Why does this happen and how can we help patients with it? Stephen shares some background on polyvagal theory, and gives his own personal experience to illustrate how this works. Check it out, it’s just 4 minutes. How have you worked with patients who felt immobilized by fear without understanding the reason for it? What techniques did you find most helpful? Please leave your thoughts in the comments below. One of the most contributing factors of the shame often associated w a traumatic experience is the loss of a sense of “ground”. Thus the somatic work is often very helpful here. I notice there body posture, and then help them just experience increasing awareness of the supports that their body has n space. Usually starting with putting both feet flat on the ground and feeling the floor support their feet. Next we work on increasing awareness of the contact of their body on what they are sitting and the chair or couch is supporting them in space. After increasing this awareness, then breath work is next, with special focus on sufficient exhales so they can make enough room in their lungs to take in enough oxygen on a subsequent breath.This work is w the intent to ihave enough self supports and to have greater ease and ability to move in their environment. Sometimes this takes awhile, and sometimes the client gets the idea quickly. But the process helps them to change the sense of their “ground” which is vital to their better understand ther “figure”. I M a gestalt therapist, and this is basic gestalt work. For some kinds of trauma, I have had success with myself and with my clients by having them literally talk out loud to their body while patting/stroking it gently at the same time. (patting thighs or arms usually – though sometimes feet). It is important to avoid having them recount the experience. It’s more important just to bring their body forward to now – present time. So the conversation with the body is one of empathy and letting the body know that the experience has ended and it is safe now. Depending on the situation, this can last anywhere from 4-20 minutes. Included in the process is permission to be self-compassionate, and a strong component of telling the body that it is now in present time. To help with that part I incorporate having the client look around their current physical space and describe things by shape or color, and then go back to talking gently to the body. I never have them change what they are experiencing – just remember to be in a compassionate state as though they were talking to a small child. Wow. Incredible compilation of possible solutions. Once we find the true original cause of trauma, the healing cascades appear. It requires the readiness of spirit to be able to integrate the resolution. encourage people to describe the sensations and to locate the source f discomfort in their bodies. I often use an excellent graphic produced by Peter Levine which illustrates where feelings manifest in the body. Once we have this basic understanding of the body mind, the ability to symbolise is freed up and recovery, or at least the management if panic becomes possible. And then of course there are SSRI’s and other meds which also help . Yes, might you share which webinar or his book as I do not recall seeing one in his book but can review if this is the place where you found the handout. I agree a visual is very helpful to me and gives them a chance to utilize this as well if they are visual people as so many are as opposed to auditory. thanks. I experienced a deep trauma many years ago. I had a four month old baby and joined my husband in Japan.I had to travel for 24hours to reach Tokyo…Became exhausted and started to have breathing difficulties. We tooka trip to an island from Yokohama Thinking the fresh air would help. Whilst my husband was at work I had a severe attack of asthma,There was no one who spoke English so the panic started that I would have to get back to Yokohama to get treatment. Having two young children gave me more pressure.When I did get back I was admitted to hospital alone as my husband needed to care for the children.I did survive the night ,but buried all emotions of terror and fear. Feeling that was the only way I. Could cope.I suffered for many years with panic attacks and anxiety not linking the emotions to the trauma. Years later I was treated for depression and given a drug which gave me a neurological disease called Dystonia…..After a long journey I now think that all the unprocessed emotions had been stored in my nervous system and the drug was not the cause of the disease but the effect on my nervous system.All the pain fear and terror had been buried and there was a lot of shame that I had put my children at risk as well as my own life .I have never been free and it is reflected in my body. I would just like to say that I am sorry you had to go through that experience, Maria. I also hear your frustration that you have never been free and your body is paying the price of that enslavement. I have a story to share, and a thought that may help you have some new perspective? When I was young, I had a near-drowning, and I got yelled at for falling in the lake. I was put in a warm tub and then put to bed. No one hugged me. No one told me I was okay. No one ever talked about it again. They just were in their own state of panic. and then in the following days/weeks etc., they were in their own shame of not having been better guardians and parents. I think we can pick up on the energy of others at times of stress like these, because our system is wired for survival and is on high alert. So some of the shame I had take on at the time was actually theirs. I wonder if some of the shame you picked up was really not yours. Sometimes when health professionals are trying to help us, they also get triggered because they are trying to “save us,” and they also go into shame for their own reasons. I wonder if in this case some of the shame is not yours – it could have been the collective of professionals around you. One of the things that was pivotal in my healing from the near-drowning was RET – Rapid Eye Therapy. The good news is that because it was an isolated incident (i.e., “discreet”), the RET worked for me in just one session. I was free and the event itself never traumatized me again. I could actually talk about it again. I didn’t have to pretend it didn’t happen. And I had healthy emotional flow after the session and was able to experience compassion for the adults in the situation. This was after years of depression and a host of pain in my body. I wish you well as you find yourself again. I have been struggling with this for almost 2 decades. I am a classical pianist, this is what I am good at, what I love – and I work very hard at it to prepare myself for concerts. However, going on stage and reforming triggers me and I routinely react, and when panic sets in I am in survival mode. I am so well prepared that somehow I still conclude the concerts and the music only suffers in the audience’s ears at least minimally. But to my ears and my training I know I am only giving as much as 10% of what I am capable of. I first treated this as performance anxiety, but it is clear to me now that it is a trauma response and I have limited my concerts so as not to retraunatise myself. However, I am determined to crack this: this is my life, and I have worked incredibly hard at understanding and processing my past. I love music and i would like to share this. It is crucially important to me. I have found EFT and matrix reimprinting have helped, as well as hypnosis and KungFu (really counter intuitive for me but perhaps good on that account alone). I would welcome any more pointers, suggestions, help, and free courses (my career is slow and this of course also impacts my finances). I write this in all humility – thank you for respecting my vulnerability here. I am very touched by your struggle to find ways to deal with your performance anxiety. I was a therapist for many years but was very impacted by what I thought was depression and although I found many things which helped, I didn’t understand what was happening until I found out that my “depression” was a traumatic freeze response. I was in talk therapy for many years which helped but didn’t really help the body response. I have used EFT, Energy Medicine (Donna Eden), Accupressure for Emotional Healing (Michael Reed Gach) and all of these things have helped. I also used mindfulness meditation and followed a book on mindfulness for depression. Once I got off of antidepressants and got on a very good liquid multilvitamin called Prodovite my depression lifted. The next layer has been intense anxiety in response to a lot of triggers! I found something called Tension and Trauma Releasing Exercises developed by David Bercelli. I took the Level 1 training and did 40 sessions about twice a week. I was astounded at the power of these exercises to shift my state from anxious, shut down, mentally fearful to calm and open. The result of doing these exercises on a regular basis was that I became much more aware on a very subtle level, of signals that I am going into shutdown or flight mode. I was taught originally online on Skype and it is possible to find a provider. There is also a wonderful blog by a woman named Joanne Thompson called Waking the Dragon. She writes some wonderful articles on how regular TRE has transformed her life after many years of therapy. She is an excellent writer and what she writes is inspiring. There are a number of books on TRE which you can get with free shipping from thebookdepository.com. There are also YOUTUBE videos on TRE. I think that there are many tools we need in our “toolbox” and definitely TRE is something I know I can go back to doing over and over. During my >ten years of working on my fears and removing toxins (the two were closely related in my brain because my mother tried to kill me by exposing me to toxins multiple times during the day during the first 3 years of my life), I learned to track down where in the brain the circuits triggering my physiological symptoms of panic attacks. I first had to break down the symptoms into all the different sensations involved. I used mindfulness, muscle reflex/response testing (MRT) and visualization to ask questions of my brain (I am certain these questions target the brainstem because they depend upon simple flexor/extensor reflexes for “yes” and “no” answers) as to what structure triggered the suppression of breathing or heart rate, in the freeze response, and the emotion I was feeling. It amazed me early on in this training as to what emotion I felt, too. I used the above techniques to do a backwards trace of this structure to which structures synapsed with it, following a circuit, sometimes of an order of 8-16 neurons, in all levels of a hierarchy from posterior medulla to telencephalic derivatives. That repeated practice for every attack (there were sometimes hundreds of attacks each day) helped to train the brain to do it “in background” over a period of 3 years. Thus, it learned to do it on its own, without me being aware of every step. The brainstem triggered images, words, or sounds to my awareness when needed (it seems the brainstem analyzes content differently from how the neocortex does) to find all the associated neurons in the brain that might need to be repaired. This brought down the level of panic attacks to at most 1/day and now they seem to be extremely rare, and generally only when a particular toxin is coming out of a bone. Thus “body memory” is actually brain memory, and in particular by the brainstem. That is why I think that there are cells allocated to the function of memory in the brainstem. They help the brainstem “recall” some of the aspects of a traumatic memory so it can trigger responses that worked in the past, specifically sensations associated with control of respiration, heart rate and blood pressure. I suspect that these “memory” cells are where babies store their early memories until the neocortex and its connections to the brainstem are fully developed. This would normally occur during the first three years of life, making recall of memories from that time period difficult to achieve once all those fiber tracts had been developed. This theory also depends upon a theory that many neurons in the brain are not myelinated, and thus can be dynamic, forming only when they are needed, often for a nanosecond, and that they depend upon markers laid down on the cell membranes of other neurons/oligodendrocytes to guide axons to the target cell they need to recall such memories. These brainstem memory cells might hold the equivalent of GPS coordinates of all the other cells holding parts of the full memory, such as blood pressure level, heart rate, proprioception, pain, touch, temperature, pressure, image, sound, or smell of specific areas of the body/brain. It is only when these “GPS” cells can trigger most of these other cells that full recall can occur. The brainstem itself only needs some of these sensations to do its job of sending that coordinated memory to our awareness (the hippocampus) in the neocortex. In fact awareness of the simple sensations in the body is not necessary, or is harmful, as what happens with hallucinations. At the other end of the circuit, we do not need to have an image in our minds to “recall” traumatic feelings. Thus, the surprise to Stephen Porges’ neocortex that he had an extreme fear of being stuck in an immobile position. Now, another aspect cannot be left out. I also think the brainstem has cells associated with emotions there, as well. As we learned in Antonio Damasio’s book “Descartes’ Error”, the decision maker in the frontal lobe can’t make a decision without emotional input to give weight to particular conditions. The same helps the brainstem choose the best route. That is why there are so many different circuits in unconscious parts of the brain that can trigger a freeze response or a strong emotion, or attack behavior. Some of these are not accessible since they got damaged during life and the brain made up a new “workround” circuit. As long as we only consider certain telencephalic derivatives as being in the emotion circuitry, we ignore the strong possibility of their role in creating conditions leading to Alzheimer’s and other dementias, which have been shown to have strong contributions from the brainstem. We will continue to think the tail wags the dog. Both the body and brain have responses that seem to be very unhelpful in the long-run, like the freeze response, which makes it seem to be a memory of past events. The medulla, especially, is not concerned with the long-run. It is only when we learn how to integrate the brainstem better with the neocortex that we can teach it the importance of the long-run response in specific circumstances.That takes the kind of practice I do. But the brainstem will continue to act like a two-year-old throughout or lives. That won’t change. addressing some behavior adaptations for traumatized youth. I was familiar with Peter Levine’s for with adding Freeze to the Flight/Flight stress response. This was very helpful. Dr Porges seems to have taken this a step further- and explaining the freeze/ immobilization response further really helps address the shame that so many traumatized youth feel. At CAS they mentioned an adaptation that they called “overly-compliant” response that fell in this category. I was wondering if Dr Porges (or anyone following this thread) knows more about this. I have a student that I feel may fall into this category. It’s terrifying because it seems that he cannot defend himself/ he has no choice/ his fight-flight has failed him. Any help or direction would be greatly appreciated. Thanks for bringing this up. I had not thought about the possible relation between being overly compliant (likely as an adaptive mechanism) and the freeze response. I think you’ve got something there and any direction with this would be of great help to me as well. Both for personal reasons and professional understanding of a possible connection here. I guess, then, I’m reiterating Susan’s request for help. Any ideas out there? I agree Susan and Jane. As a social worker , i meet a with people who are often stuck in life and its often misread as laziness. Porges experience and some others i quickly read below are indicative of pre-conscious body memories of panicking, when emerging from the birth canal. These are well documented in pre and perinatal psychology. The MRI freeze state is the *tunnel experience* of being born,— physically recollected. Who wants to go back to that state of sheer unknowing and being pushed by the mother’s contractions, out of the peaceful EDEN of the womb? Pre-birth is the body’s most vulnerable time, and hardly feels controlled by the baby–hence the fear and helplessness re-iterating when revisiting the tunnel scene! I work as a psycho sexual embodiment therapist with people recovering from severe childhood developmental sexual trauma with parts of the personality encapsulated and disconnected from other parts so that when these are activated it is like dropping into a dorsal drop pool with total immersion for the person. My job is to hold them safe while they are in there and find ways of reaching them and if necessary going in there with them back in time to the place they are immersed in a frozen state. Sometimes it’s so awful being in the memory and too awful too remembering the memory and there’s been times when we are in the gap between worlds, a kind of void of hopelessness. What’s helped us at times is me asking “what animal do you need right now to help you?” Somehow it’s reaaly clear and without hesitation an animal arrives on the tongue of the person. In one such experience, it was a rhino. I looked up rhino as a power animal on my phone with my client in my arms frozen and terrified and began to read into the unknown calmly with hope that some illumination might come. Sure enough, it was the perfect piece of wisdom, like choosing a tarot card, and this supported her to come back into connection with some Resouces to help her. It gave us a bridge and a metaphor symbol to contain the terror and bring some agency and empowerment. Something I was at a loss to provide – thank god for the internet and an intuitive search for a resource to help! I often ask this question now as animals can be great comforts when humans can’t be trusted yet again. Having a symbol or metaphors helps contain immersive experience and supports differentiation from them like coming up for air from drowning in terror. We can then negotiate with the data and rehouse it in manageable digestible forms in the memory banks (hippocampus?) and eventually once the nervous system responses have calmed down with differentiated familiarity and sharing of the experience, the person might then experience choice with remembering or parking remembering depending on perceived intuitive capacity for self regulation and equilibrium. I’m not a Dr. but i’ve always felt these are not just claustrophobic – they are harmful to the body because of unhealthy EMF rays … they are the opposite experience of ‘spaciousness’ that the brain and etheric field of the body loves — yes this feeling is natural; for the same reason i’ve never been able to live in a bsmt. apt. very successfully; love hanging out in churches, natural sunlight; the whole experience; surely they could have designed those things to be vertical instead of horizontal? Big difference to where the mind believes it is going. I have more recently been exploring more dynamic methods for trauma resolution….I was certified this year as a Rapid Resolution therapist ( Dr Connelly), am using more hypnosis and visualization, breath work, mindfulness and psycho education to help patients understand how the mind/ body reacts related to trauma and trauma related symptoms. I plan to complete training in CRM this spring as well as train with Courtney Armstrong in the use of hypnosis with trauma. I am so excited to become more effective in facilitating patient healing and clearing! I have had several events that were traumatic to me, going back to 15 months old and quite a few after that into my adulthood, last being Hurricane Katrina’s impact on us. I found out about Dr. Connelly’s work about 4-5 years ago and decided to see if it might help me overcome the hypervigilance over a particular moment when I received a devastating (for me) phone call when my 10 day old baby girl was diagnosed with PKU. The memory, which was very clear in my brain/mind, doesn’t and handled so poorly, was truly addressed with RRT. My sister lives in Chattanooga, where Armstrong practices. Though we/she weren’t able to get appts with her at the time, amazingly, I found a counselor who knew Armstrong and used Armstrong/Connelly’s work to help me in 2 sessions. Mind you, that was a 39 year old memory at the time. Not long after, I either took or suggested 4 people try it for varying issues. It was amazingly helpful without all the talk therapy. I am a student of ACIM, which led to my first and greatest trauma release in 2005, after some years of ACIM (which I believe is a form of limbic retraining and have found it called so of late), a short hypnosis session just days before my monthly rolfing (had been having montly for about 3 years for a bad fall). 30 minutes into my session, my leg began to shake and then my entire body shook all at one time for a full 30 minutes. The result of that experience (my rolfer gave me his Peter Levine book, Waking the Tiger to read). For 2 months, though impossible to explain with “human words” I lived in a state of Perfect Love, Joy, Nonjudgment (there was no worrying mind about anything while in that state) until Katrina hit. It’s a long story but I do believe we can live as it says “thy kingdom come, thy will be done, on earth as it is in heaven”. I’ve used other tools since that enormous release left me Divinely present in this world, but not of it. You will be able to help so many. I have to be sedated to have a MRI and have a problem with many other situations.